By any measure, the 2010 growing season has been an outstanding one for Long Island grape growers. Across the island, I'm hearing reports from vineyard folks saying that the grapes are anywhere from 10-20 days ahead of schedule. They're further ahead than in 2007, often lauded as the region's best ever vintage. In 2010, it's been about more than just hot days -- cloud cover and the UV rays they can filter have made an impact too. Rich Olsen-Harbich, winemaker at Bedell Cellars, told me a few weeks ago "Not only have we been hot and sunny, but the sunny days are clear with a low percentage of cloud cover." Increased UV exposure -- coupled with leaf removal from the fruit zone -- means lower levels of methoxypyrazines. Those are the compounds that can give red wines underripe, bell pepper aromas and flavors. Increased UV can also lead to more TDN in riesling too -- think petrol character -- but riesling isn't a big player on Long Island. To illustrate how big an impact UV can have: 2003 -- anything but a classic vintage on Long Island -- was a very warm one too, according to Olsen-Harbich but there were fewer than 30 "clear days" all season. The vintage suffered and several underripe reds made their way to store shelves. Despite the great weather we've been enjoying, local growers and winemakers are watching the weather closely this week -- not to keep an eye on cloud cover or even temperatures (which are expected to remain in the 90s). Instead, they'll be keeping an eye on Hurricane Earl, which has a predicted path up the eastern seaboard and over the East End of Long Island. Computer models aren't always reliable, but Hurricane Earl hitting wine country could have dire and serious consequences. "The effects a H -- I can't get myself to say the word -- can have on a vineyard depends on the severity of the 'hit,' the amount of rain that comes with it, and the speed it is traveling," says Rich Pisacano, vineyard manager at Wolffer Estate and co-owner of Roanoke Vineyards, adding "A direct hit can lay down an entire vineyard by snapping poles at the ground, send bird netting into the next town and of course destroy the crop." Such devastating damage would require a lot of time and money to remedy, rendering "a complete crop loss the least of the problem" according to Pisacano. Unfortunately, hurricanes aren't anything new for local grape growers. Powerful named storms have damaged vineyards past, most recently in 1985 and 1991. "In 1985, when the eye of Hurricane Gloria was over Nassau County," Charles Massoud, co-owner of Paumanok Vineyards remembers, "the northeast quadrant of the storm was largely a wind event. It broke lots of trees but it brought lots of spray from the ocean. The salt from the spray dessicated the leaves and after three days the vineyard was essentially dead." Luckily, the Massouds had already picked and sold their chardonnay before the storm hit. Hurricane Bob, which passed just east of Montauk in 1991, was largely a rain event with strong wind. Massoud told me in an email "That bruised the fruit as though the clusters were sanded. That was at the end of August. Those of us who were quick at treating for botrytis salvaged a decent vintage in spite of the trellis damage from wind. The bruising developed scabs that increased the phenolics and required careful treatment at winemaking time." Luckily, there was plenty of rain to wash away any salt from ocean spray that year. These types of events are why you can't christen a vintage "the best ever" until the grapes are into the winery. I credit our science editor, Tom Mansell, for putting me firmly in a barleywine-craving mood with his What We Drank this week. The powerful, intense style is gloriously complex and balanced when done right, and the perfect answer to a long day or week as it reduces the world and all its problems to the need for a nice cigar and bed. Druid Fluid from Middle Ages Brewing Company pours a light one-finger head and orange-amber hue into a snifter glass, where it maintains light lacing. The nose is vague orange flavors and a hint of cream puffs but mostly the understated malt character of a relatively aged beer. There's no bottling date on this bottle (ordinarily a red flag), but barleywines are traditionally crafted for cellaring and Middle Ages specifically suggests aging this beer, so I proceeded. On the palate there’s the sweet alcohol typical of the style, some orange peel and a razor’s edge of harsh hops, but that’s as far as it gets before a thin and resiny hop finish. At traditional barleywine temperature (50-60 degrees F) it tastes tired; cooler than that it gets a boost from spotlighted carbonation but little additional flavor. Though air time opened up just a bit more fruit esters, this was ultimately more of a chore to drink than a contemplative indulgence. The true barleywine ages with grace, losing bright fresh notes but acquiring complexity, and without a bottling date to give me any sense of the age of this beer I have to be concerned. This is what’s on the shelves in my town, and it’s not indicative of the power and beauty of the style. Brewers: date your bottles! The Long Island Merlot Alliance (LIMA) was formed in 2005 with the goal of developing quality standards in the production of Long Island merlot and to establish Long Island as the leading region for merlot in the New World. To date, the going has been slow with that mission. Though I know the group has done extensive research and analysis, little of it has been published or shared publicly. Still, the group has released several vintages of Merliance, a cooperative, 100%-merlot wine made using two barrels from each member winery. It's an interesting -- and challenging -- concept for a still-young organization because, as membership increases, it's bound to become more difficult to craft an integrated, singular wine from all of those various barrels of wine grown and made at different wineries using a diverse array of vineyard and cellar practices. Long Island Merlot Alliance 2007 Merliance ($35) shows the power an intensity of the vintage certainly, but was released perhaps too early. The nose is dense with black cherry, blackberry and plum with light baking spice, burnt sugar, toasty oak and subtle grilled herb character. On the palate, it balances power with grace -- like the best Long Island merlots often do -- but still shows a bit too much oak. A ripe, intense core of dark fruit lurks beneath the oak with vanilla, licorice, rosemary and a little graphite accents. The finish is long with a woodsy herbal note and cedar character... and just a little heat. While deserving of a re-taste in 6-12 months, the oak is just a little too prominent right now for my tastes. It's still summer and this month's New York Cork Club selections reflect my still-strong preference for white wines this time year. They are Lieb Family Cellars 2008 Pinot Blanc and Red Tail Ridge Winery 2008 Dry Riesling. If you haven't herad of the New York Cork Club (NYCC), it's pretty simple. We've partnered with BacchusWineOnline.com to create a wine club that features only wines made in New York -- making them more accessible to people around the country. We can't ship to every state, shipping laws being what they are today, but we can ship to a lot of them. Lieb's pinot blanc has long been a local favorite. Pinot blanc can sometimes be a bit boring, but not so here where fresh pear and apple aromas reach up out of the glass and get your attention with a little melon, wild flower and subtle nutty character. Fresh, snappy acidity lifts Gala apple and more pear flavors on a medium-bodied palate, with nuances of honey and nuts lurking in the background. The finish lingers nicely with a saline note and a squirt of citrus -- making it both thirst quenching and appetite whetting. This is a wine that local seafood longs for. 2008 rieslings from the Finger Lakes have been wowing me all summer during my weekly tastings, and this one stood out amongst an impressive group of dry versions. It features a citrusy nose of lime and sweet grapefruit with obvious flinty slate character, and subtle floral and sweet herb notes. Extremely focused and zesty on the palate, green apple, lime and lemon peel flavors are framed and energized by electric acidity. The finish is long with trailing slate flavors that linger along with more citrus and sweet herb. It was almost a year ago that I wrote about Empire Red, a new wine from Hudson-Chatham Winery that combines the key three red grapes -- baco noir, merlot and cabernet franc -- from each of New York's largest wine regions, the Hudson Valley, Long Island and Finger Lakes respectively. Co-owner Carlo DeVito and winemaker Steve Cascles haven't stopped there though, recently releasing Hudson-Chatham Winery 2009 Empire White ($15), the white wine sister to Empire Red. Made with 33% seyval blanc from the Hudson Valley, 33% riesling from White Spring Winery on Seneca Lake and 33% sauvignon blanc from Long Island, it brings together the signature white varieties of the regions. Fresh and fruity, the nose shows the full range of citrus -- lemon, lime and grapefruit -- with a little honey, hay and understated herbaceous notes. Easy drinking and citrusy (again) the palate is dominated by white grapefruit right out of the refrigerator, with faint hints of herbs. As it warms a bit, subtle peach character emerges just a bit. Good-not-great acidity leads into an abrupt finish, where that hay-honey combination peeks through again. The riesling is a bit buried on the palate -- but I guess you'd expect that with a bold grape like sauvignon blanc in the mix. Much like the Empire Red, I think the concept of the wine is outstanding but I think with the white, it's difficult to blend riesling without losing much of it's true character. This seems more like a sauvignon-seyval blend in that regard. This is one of two collaboration beers between brewers Hans-Peter Drexler of legendary Bavarian brewery Schneider and Brooklyn Brewery brewmaster Garrett Oliver. The version with the Brooklyn label is widely available but I found a Schneider label bottle and had to try it. The idea is that each brewed the same beer in the other brewer's brewery, but with different hopping to assert some terroir. Yup, I just dropped the T-word. It's not a New York beer per se, but it's a New York brewer and a pretty interesting concept. This weiss pours a gorgeous cloudy tangerine color, with a luscious peach, orange and tangerine nose. The head was a bit compromised since the bar, Cole's, does not offer wiessbier glasses, but still showed a delicate 2 fingers of citrusy bliss. Light elegant Noble hops are evident, and yeast aromas are more apparent towards the end of the bottle. The palate explodes with a full burst of citrus fruit salad, with layers of fruit, hops and just the right amount of carbonation (American weiss biers tend to overdo it in this department, but Garrett Oliver nailed this one). A pure pleasure to drink, and a fascinating example of the collaboration beer trend. The famous opening line from Charles Dickens' classic "A Tale of Two Cities," set in 18th-century Europe, would appear to be an appropriate description of the opportunities and challenges currently facing wineries in the towns of Southold and Riverhead. This growing acknowledgment of our region's new prominence in the wine world would normally be a cause for local pride and celebration, but it is clear that not everyone shares the enthusiasm. Unfortunately, there is now growing pressure for Southold and Riverhead towns to adopt new rules that would severely restrict winery events, removing a crucial source of revenue, particularly in the current economic climate. Because of the scale and cost of wine production on Long Island, tasting room sales are critical to the survival of our local industry. Although some producers are successfully generating wholesale business around the metropolitan area and building direct shipping revenue through such means as wine clubs, tasting room sales still account for a significant percentage of a producer's revenue. Over the past two years, the ratio may have become even more pronounced as wineries' restaurant sales suffered during the recession while tourism to the region continued to grow. Clearly, direct marketing activities -- both public and private -- at local wineries have helped spur tourism on the North Fork. However, the rising number and variety of events have raised questions about whether certain activities should be allowed, and if they should, under what circumstances. Some people have suggested that wineries are moving beyond their original agricultural focus to become shadow restaurants, catering halls, concert venues, etc. They also argue that since wineries benefit from agricultural tax exemptions, they are competing unfairly with non-agricultural businesses that offer similar services. New York State understands that small farms, including vineyards, need to be able to engage in direct marketing activities to help generate product sales. These practices are promoted and protected in several sections of New York State's Agriculture and Markets Law. The interpretation of what constitutes direct marketing and agri-tourism is both broad and open-ended, as long as farm product sales remain the primary objective. Moreover, certain activities, such as serving food to complement wine tastings, are expressly permitted under the State's Alcoholic Beverage Control Law . The contention that wineries are somehow not paying their fair share of taxes is also false. Notwithstanding the fact that wine is the only agricultural product subject to excise taxes, it is true that vineyard owners, like farmers of any other crops, can apply for annual exemptions on land in active agricultural production. All farmers can also receive a 10-year exemption on new farm structures, such as barns. But the land and buildings used for winery facilities and tasting rooms, where the controversial agri-tourism activities generally take place, do not receive any favorable tax treatment. 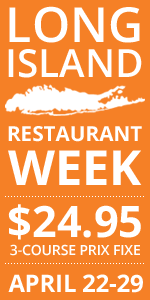 Indeed, the Southold assessor's office recently confirmed that not only are Southold wineries subject to the same rules on winery and tasting room buildings as govern any other business, but wineries also pay more -- in some cases substantially more -- than local businesses that are claiming unfair competition. Editor's Note: This piece ran as an op-ed in the 8/19 issue of Suffolk Times. There's still at least one "BP" that isn't destroying the world. Blue Point Brewing Company, creators of multi-award-winning Toasted Lager, has responded to the Gulf oil spill disaster the best way they know how: by crafting a beer dedicated to our feathered friends affected by the crisis. It's been dubbed Toxic Sludge, and the proceeds from its sale will support the Delaware-based bird rescue organization Tri-State Bird Research and Rescue. The spill, caused by an explosion on April 20 of this year, has widely affected wildlife, but Blue Point president Pete Cotter explains his particular sympathy for the plight of Gulf area birds. "We on the South shore of Long Island see many birds in the spring and fall, just cruising through. I live on a small body of water and have the pleasure of sharing their experience with them." Autumn is fast approaching, and birds migrating south for the winter will face a rude awakening when they find their sunny winter home covered in, well, toxic sludge. 100% of funds raised by the sale of this beer will support Tri-State's bird rescue campaigns now and in the coming years. So what exactly does Toxic Sludge taste like? For starters, it's a black IPA, an up-and-coming style attempted as of yet by only a handful of well-known breweries. "It’s basically similar to a traditional IPA with a dark malt bill," explains Cotter. "The beer is now in the tank. What we’re looking for is a fragrant, dark, hoppy ale without the sweetness that you would associate with a dark beer. This dark version of an IPA should satisfy the inquisitive pallets of hopheads." Cotter hopes to send Toxic Sludge to all twelve states in which the brewery has distribution. Blue Point's critical success and widespread appeal make the brewery's voice a powerful one, and this project is sure to promote awareness of the spill's environmental ramifications. "I’m just glad we are fortunate and successful enough to be able to do fun projects like this," Cotter says. "Since winning some big awards a few years ago, we’ve been growing at a fairly good clip and it’s easy to get sidetracked to what’s really important. We have no corporate ties and I think that’s apparent with this project." Look for Toxic Sludge just in time for migration season - it's another great reason to drink beer. For more information about this project visit bptoxicsludge.com. My wife and I had lunch at the Village Tavern in Hammondsport on Tuesday, and we encountered a mind-bending wine list. 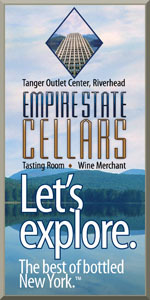 The Tavern is well known for its long selection of aged Finger Lakes wines. Lenn and I have both written about it in the past. The good news is that the Tavern has ideal storage and a staff that pledges to taste the wines periodically to make sure they're still showing well. But this most recent visit revealed an even longer - and frankly, more bizarre - list than I remember seeing at the Tavern. Start with the by-the-glass list. The Tavern was pouring Glenora 1995 Cabernet Sauvignon, Dr. Frank 1995 Cabernet Sauvignon, and Fox Run 1997 Lemberger by the glass! And that's just the start. My wife ordered a Hermann J. Wiemer 2003 Dry Rose that was, sadly, extremely tired. I tried the '97 Lemberger and also found it sluggish and muted, but not at all oxidized. It defines the notion that wine can hang on with age if not necessarily improve. However, a glass of Chateau Lafayette-Reneau 2002 Riesling was wonderful and fresh. Then we turned to the bottle list. That last wine is a Tom Mansell special. Hey Science Ed, will you go try out that Vincent in the name of research? I'm not saying these wines are all dead. But the track record of Marechal Foch or Vincent or Finger Lakes Petite Sirah might not lead most experts to expect much out of them. I hope I'm wrong. The Tavern is always a treat, thanks to this quirky list that seems to grow ever quirkier with age - perhaps like a fine Finger Lakes Foch. Not all that many have hit tasting room lists or store shelves yet, but if the early returns are any indication, 2009 may prove another great year for Finger Lakes riesling. Swedish Hill Winery 2009 Dry Riesling ($16) very well may be the best wine I've tasted from Swedish Hill. Intense melon and lime aromas dominate the nose with supporting green apple and citrus blossom notes. Forward and fruity on the palate, it delivers juicy melon and sweet lime flavors with integrated acidity and a finish that lingers nicely with more lime, more melon and just a little floral character. Not overly complex, but shows great balance and good focus. According to winemaker Matt Berenz "I'd say we are 2-2 1/2 weeks ahead this year. I can see us bringing in riesling around mid-September"